In the mid 1880s Russia and UK were locked in a cold war. Russia was afraid of the British attack such as happened during the Crimean War, while England was scared that Russian expansion into Central Asia would lead to Russian attack into India. Two countries almost came to blows in 1885 when Russia launched an expedition into Afghanistan. On the naval front that confrontation included a tense stand off between Russian armored cruiser Vladimir Monomakh and British battleship Agamemnon in Nagasaki harbor in Japan. Everything ended without firing a shot, but the situation between two countries remained tense. In this atmosphere Russian navy realized that they may have to fight the Royal navy, but at the same time they also realized that they had no hope of winning a straight up battle. Instead they chose, as most of the weaker naval powers have been doing for centuries, to concentrate on a commerce warfare. 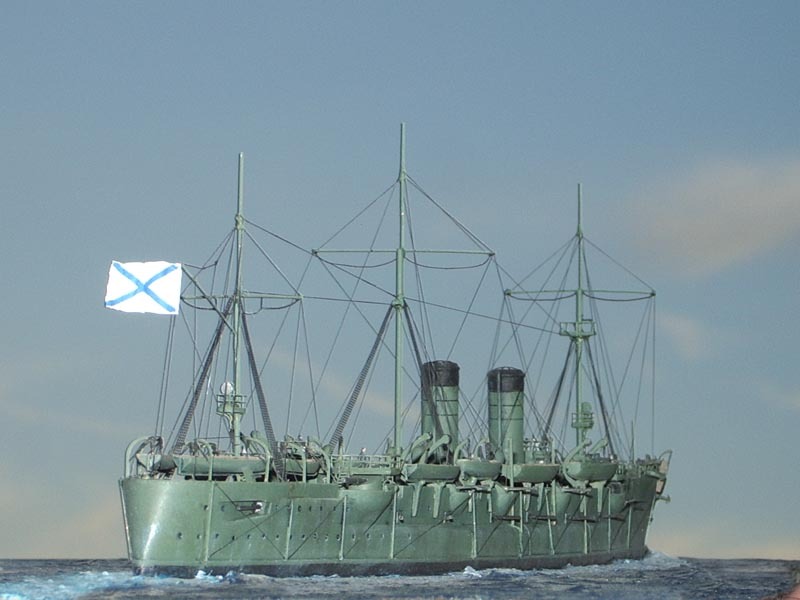 Most of the Russian cruisers of the 1870 and 1880s were designed to be primarily commerce raiders. 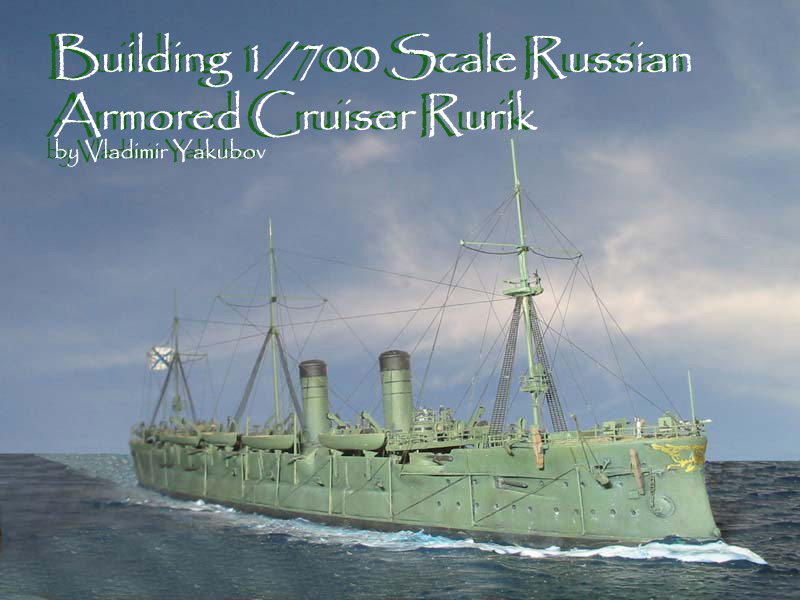 In this atmosphere Russian navy started a design of a new armored cruiser Rurik in 1888. It was based on the previous armored cruiser Pamiat' Azova, but was 50% bigger. 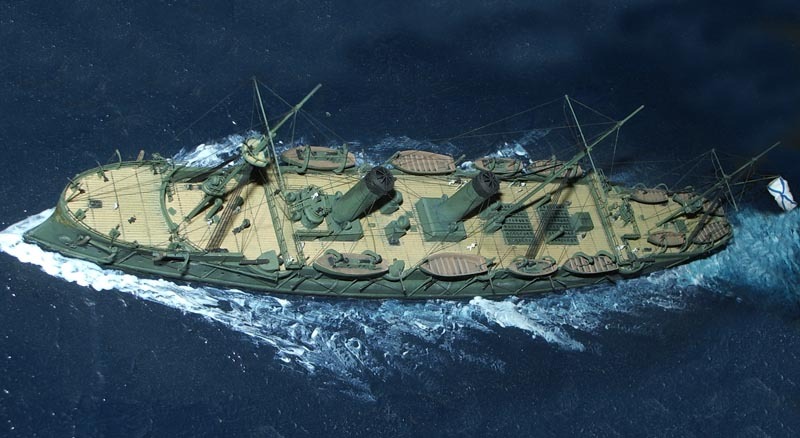 There was a lot of debate in the navy on the characteristics of the cruiser, as it was a biggest cruiser ever built for the Russian navy at the time, but in the end the designers settled on the ship that displaced 10933 tons, was 130.1 meters long at the waterline and had a top speed of 18.8 knots. It was to be armed with four 8"/35 guns and sixteen 6"/35 guns and protected by a 10" armor belt. Since the ship was designed as a commerce raider from a start it had a very long range of 7600 nautical miles and as a carryover from previous days carried a full set of sails to be able to save the coal during long cruises. Rurik was laid officially laid down on 19 May 1890 and launched in November 1892. 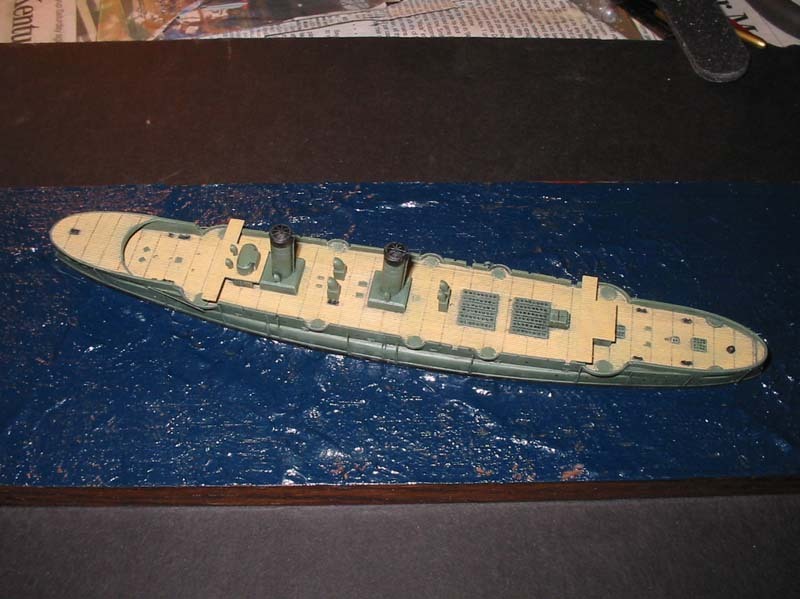 During it's construction Russian navy was able to purchase license to produce new quick firing 6"/45 and 4.7"/45 guns from Canet in France and it was decided to to replace Rurik's old style 6"/35 guns with sixteen 6"/45 and six 4.7"/45 guns. 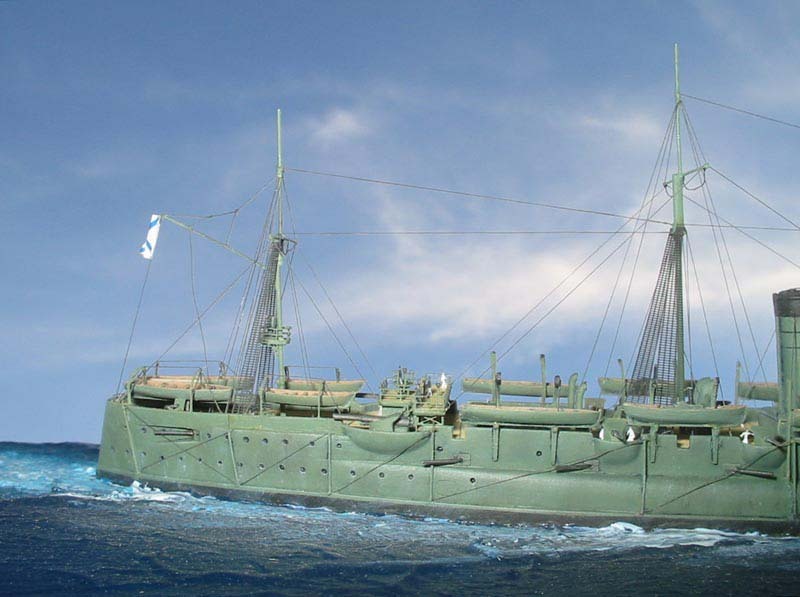 Due to these and other design changes fitting out took three years and Rurik was finally commissioned into the Russian navy on 16 October 1895. Even before it was commissioned Rurik had a huge impact on the naval world of the time. In June 1895 it was sent to represent Russia during the opening of the Kiel canal. A largest cruiser built at the time with large number of guns extremely impressed the naval officers of the German, French and Royal Navies and caused a reaction in naval circles comparable with appearance of the German Pocket Battleship some 35 years later. British newspapers raised a lot of noise about the "cruiser gap", which in turn resulted in Royal Navy laying down two huge protected cruisers HMS Powerful and HMS Terrible, the biggest warships in the world at over 14000 tons. And just like the great panic that was caused by the German Deutschland class pocket battleships, it was overblown and over rated. While Rurik was certainly powerful, it also had several large flaws. 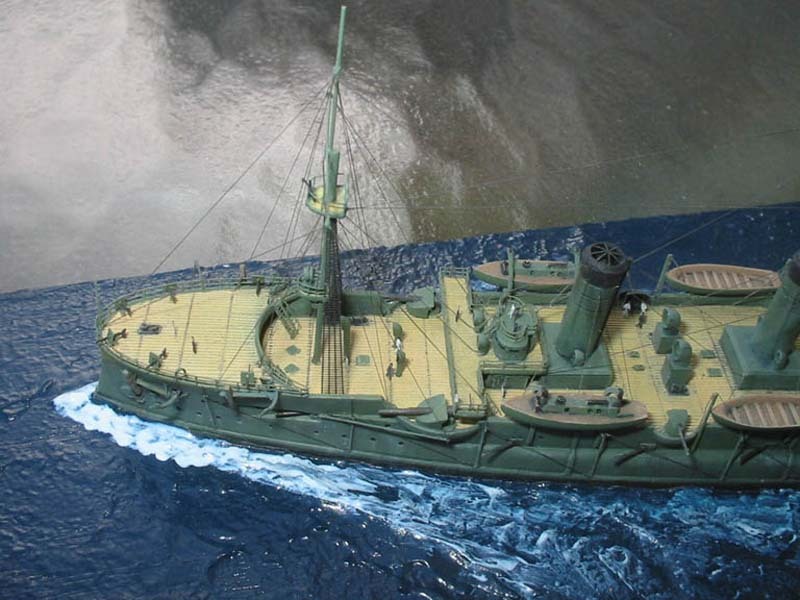 The artillery was not armored at all, which meant that in any type of prolonged combat the artillery would have been knocked out pretty easily, it was relatively slow - 2-3 knots slower than the cruisers that were coming online in late 1890s, which mean that it could not run away if cornered and finally it is questionable whether a huge ocean raider was needed or whether a smaller ship would have been optimal. Anyway, whatever the design characteristics of the ship were, in late 1895 there was another crisis developing in the world. This time it happened in the Far East where the Japanese have just won the Chino-Japanese War, while at the same time Russia was maneuvering to politically deny them the fruits of the victory. Russian naval forces stationed in the Chinese port Chiefu were painted in war camouflage, while emergency reinforcements were dispatched from the Baltic. The squadron consisting of the battleship Navarin, two armored cruisers Rurik and Dmitry Donskoy and gunboat Grozyaschiy left Kronshtadt on 29 October 1895. Rurik would never return to the Baltic again. 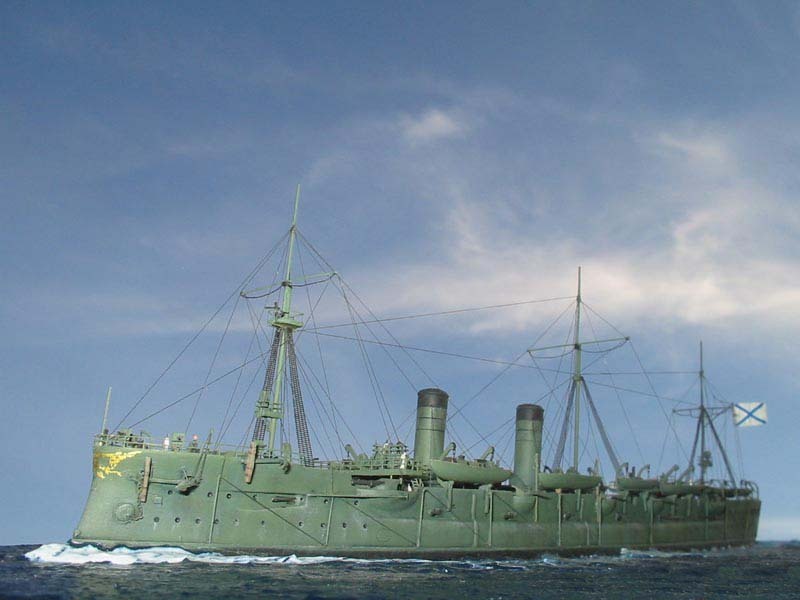 The squadron arrived into the Mediterranean Sea in January 1896 and after a two month workup proceeded through the Suez channel and on 2 April 1896 arrived into Nagasaki, which ironically, despite the tensions with Japan was the main Russian base in the Far East. 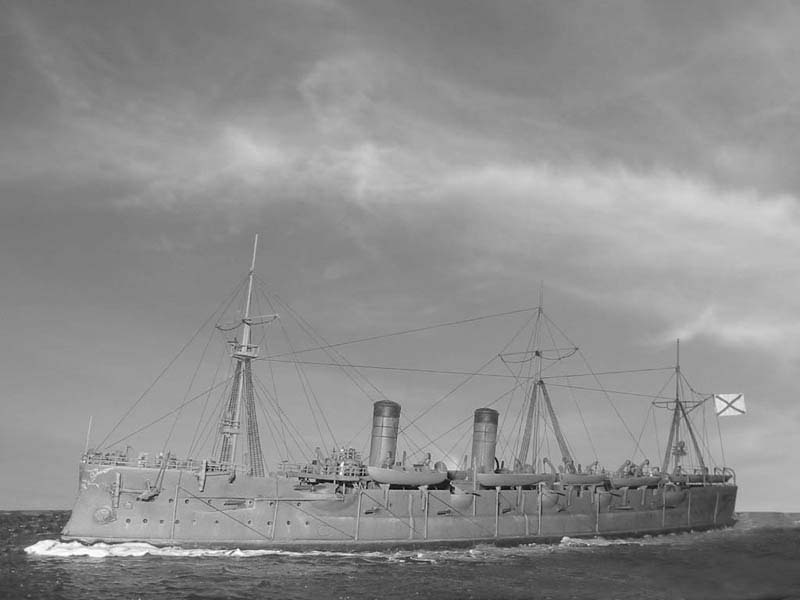 For the next several years the ship was involved in the active patrolling of the Yellow and Japanese Seas, keeping an eye on Japanese expansion and showing the flag in the ports and training. In March 1898 after some arm twisting of the Chinese, Russia signed a 25 year lease on the Chinese naval base of Port Arthur. To prevent any attempts from the British to occupy the port before the negotiations were completed Russian ships including Rurik were sent to Port Arthur in January of that year. On an interesting side note, Russian admiral in charge of the squadron who made an inspection of the port had a very negative report about it and in that report outline all of the problems that the Russians would have 6 years later trying to defend it, but of course the bureaucracy didn't pay attention to that report and the main Russian naval base moved to Port Arthur in 1899. In 1900 Rurik was involved in the multi-national effort to stamp out the Boxer rebellion and soon after that it went in for a refit during which its sailing rig, including the bowsprit was removed. By the end of 1903 the tensions between Russia and Japan finally reached the boiling point and Japan started to actively prepare for war. 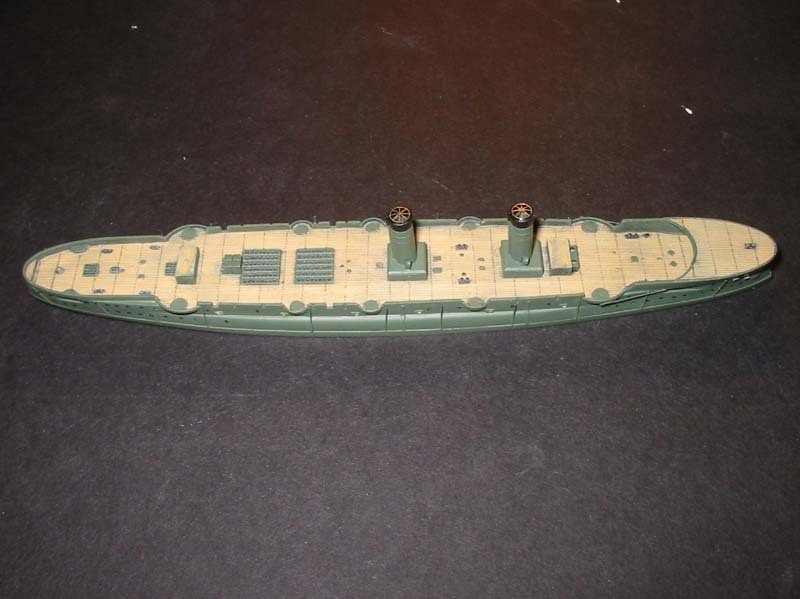 Russia was not pursuing the war, but even the Russian military and politicians realized that at this point war was inevitable, Russian warships were repainted in their dark green camouflage paint and were getting ready for war. At this time Rurik was a part of the Vladivostok Cruiser Squadron with her more modern half-sisters Rossiya and Gromoboy and a protected cruiser Bogartyr. 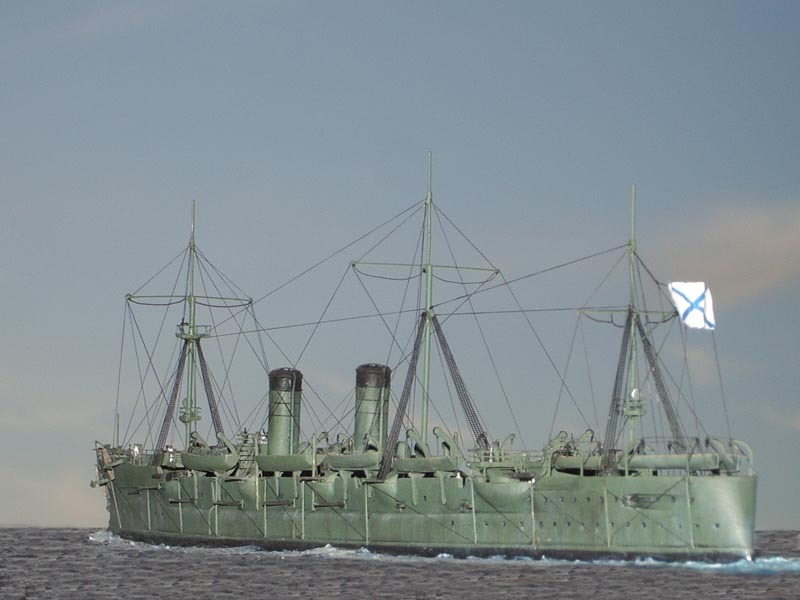 Japan attacked Russia on the night of the 27th of January 1904 and on the same day after receiving notice of war Vladivostok Cruiser Squadron put to sea. In the next seven months they made six cruises and sunk 13 ships, their biggest success came when they intercepted a Japanese troop transport Hitachi Maru in the vicinity of Korea. 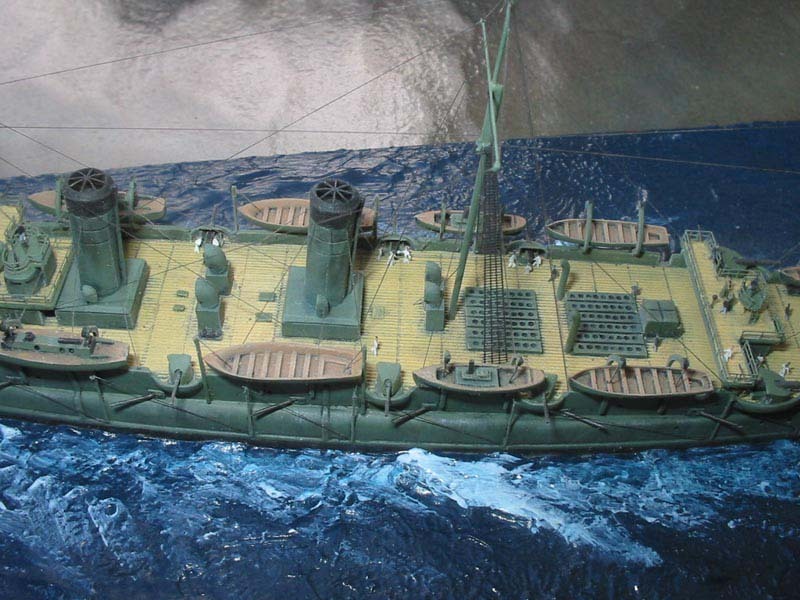 After the transport refused to surrender it was sunk with at least a 1000 Japanese soldiers and eighteen 11” siege guns destined for Port Arthur. The end for the combat operations of the Vladivostok Cruiser Squadron came as it comes typically for such raiders, cornered by superior force and unable to run. It happened on 1 August 1904, when Vladivostok cruisers were ordered to sortie to rendezvous with the main Russian fleet attempting to break out of the besieged Port Arthur. Unfortunately Russian fleet was defeated and was forced to turn back to Port Arthur, but the squadron was unaware of that happening since radio communications were still in their infancy. As the cruisers steamed to the rendezvous point they were intercepted by Admiral Kamimura with 4 armored and 2 protected cruisers 36 miles north of Tsushima, near a Korean port of Ulsan. 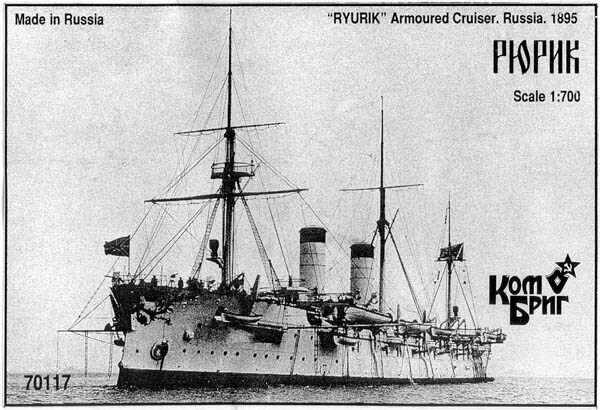 Russian squadron slowed by old Rurik (able to do only 17 knots at the time) was unable to evade more modern Japanese cruisers. 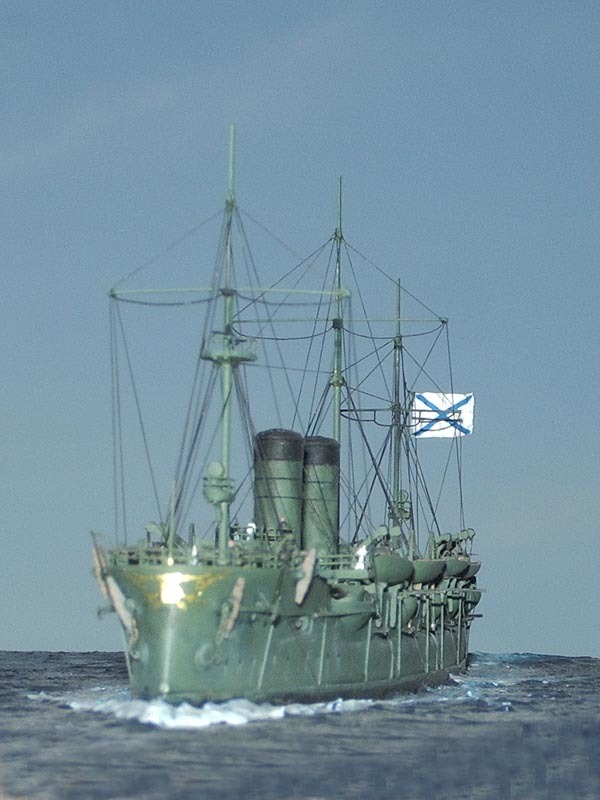 Rossiya, flying the flag of Admiral Iessen, was the lead ship of the Russian column, followed by Gromoboy with Rurik bringing up the rear. The battle began at 0523 at 8500m. Within half an hour Rurik was damaged and started to fall behind the other two ships. Russian squadron made numerous turns to enable Rurik to catch up, but at 0640 a hit on the rudder put her out of control and unable to maneuver. At 0657 Rurik was able to fix the steering and was for a short time was able to keep up, but at 0720 once again fell behind. Two other Russian ships tried to interpose themselves between wounded Rurik and the Japanese, but by 0850 it was apparent that Rurik was lost and Russian ships made their final turn toward Vladivostok drawing all of the four Japanese armored cruisers with them. 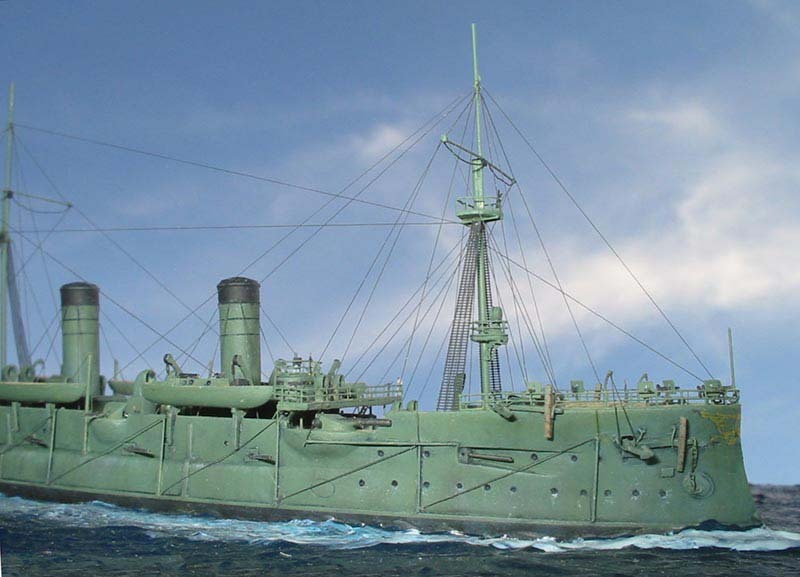 Two of the Japanese protected cruisers were left to deal with heavily damaged Rurik which was only able to respond with few guns. Last shots were fired at 1005 when the Japanese shell burst in the Rurik’s conning tower killing her captain, captain Trusov and leaving a Junior Gunnery Officer, Lieutenant Ivanov, in command. 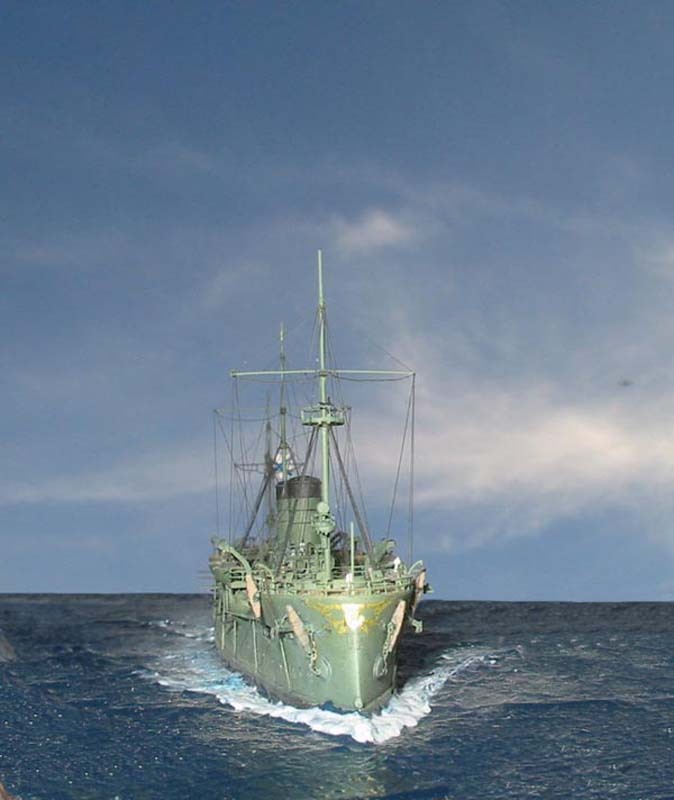 He realized the hopelessness of the situation and was determined to prevent the ship from falling into Japanese hands and ordered the seacocks to be opened and scuttled the ship. The ship sank at 1020. During the engagement Rurik suffered heavy loses. Out of 796 sailors 193 died and 229 were wounded and out of 22 officers 9 were killed and 9 were wounded. For a long time Rurik's sacrifice was not well covered in Russian history, mostly forgotten in the shadow of Variag's battle, but in 1960s, thanks to the efforts of many dedicated historians general public was made aware of the battle and of the ship and in 1986 the place of Rurik's sinking was declared a place of remembrance by the Soviet Navy and since then every Russian warship that passes the spot of the battle gives full honors to the sailors who fought and died on the ships of the Vladivostok Cruiser Squadron. As usual with my models the very first thing that I did was cut off the molded on "Aztek" ladders that some of the older Combrig kits have. Next I fixed up the sides of the hull to remove any imperfections and molded on hatches on the sides of the hull, which were flush with the hull on the real ship. I scribed the hatches to show them in the places shown on the plans. Next I glued the bases for the smoke stacks and the stacks themselves. It is very important to align the stacks because everything else is aligned based on them afterwards. To that order I glued the first stack and aligned the second one based on the first one. After that I used the red automotive putty to cover the seams. The hull has an interesting shape and is almost like a sailing ship which has a covered forecastle, since that comes as a separate part and the main hull needs to be painted under that deck, so first thing I did was to paint the deck into the tan color, then I masked the deck and painted the hull with PollyS RLM62 color that I feel best approximates the green color of the Russian ships of the RJW. 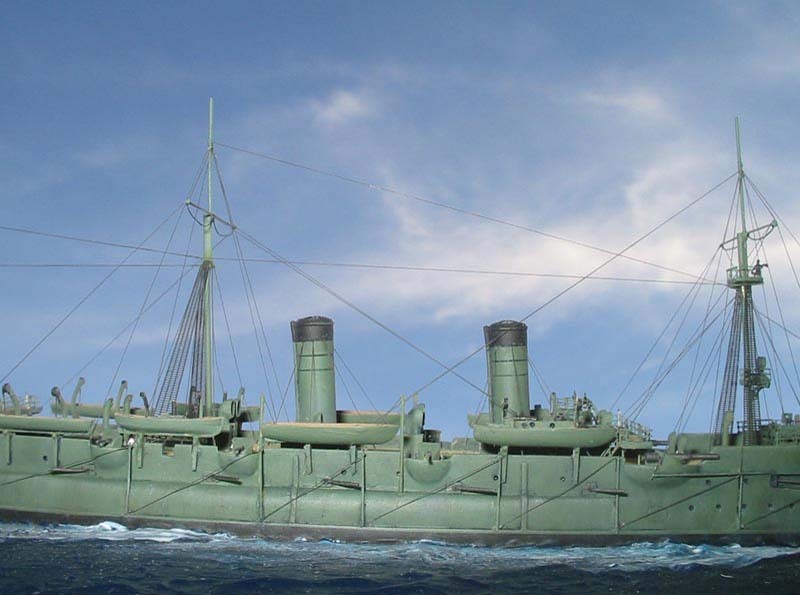 The other color that is appropriate for the ship in this configuration is overall white with yellow funnels that the ship was painted from its refit in 1901 until October 1903 when it was repainted into a green war camouflage. 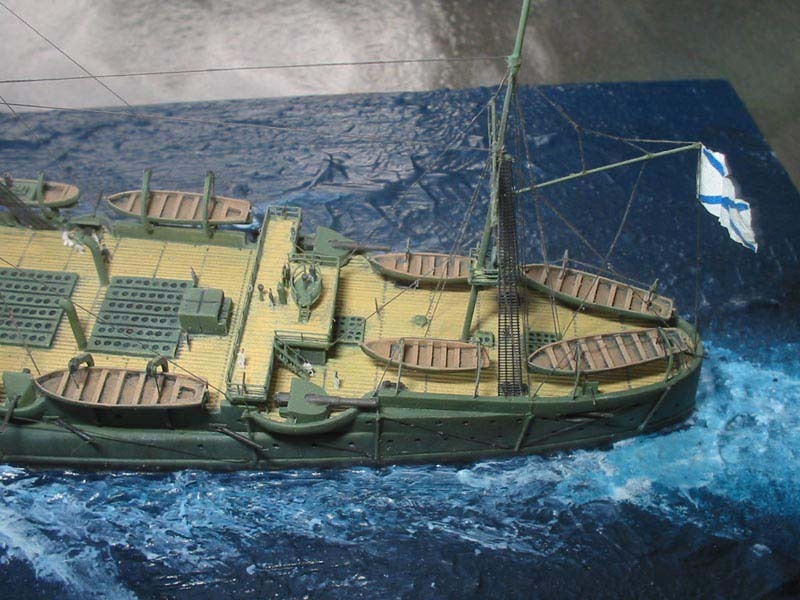 See Jim Baumann's excellent model of the Rurik for the other available color scheme. 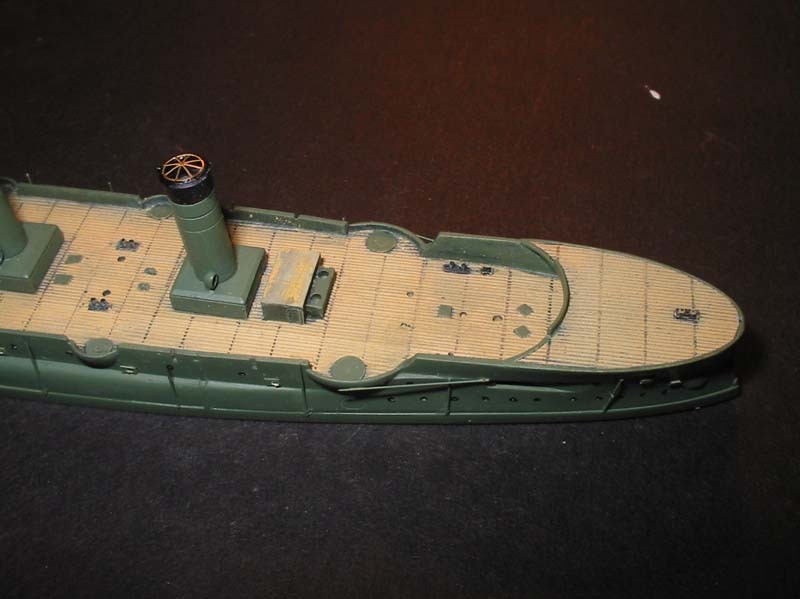 The only thing I didn't paint was the bow, because after painting the interior of the forecastle I needed to glue the deck of the forecastle and fare it in. 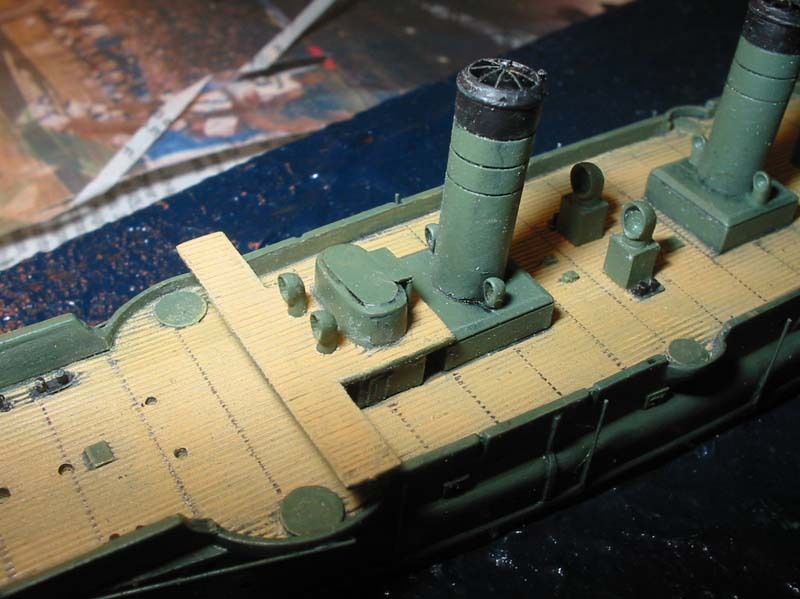 Before gluing the forecastle deck I drew the cross deck planking which was prevalent on the Russian ships of the era on the main deck and the forecastle deck. The cross planking was made by drawing it with a pencil, a technique I borrowed from Jim Bauman's build of Rurik. 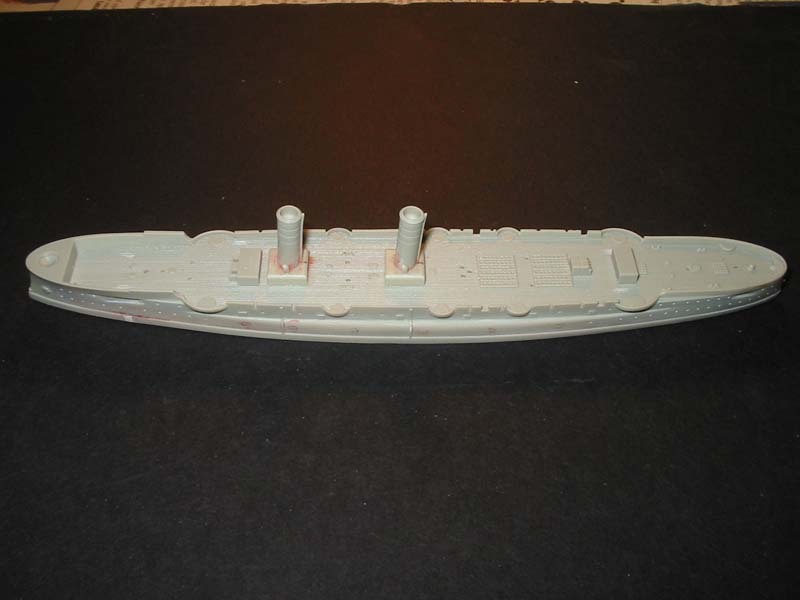 After that I've glued the forecastle onto the hull and flared it in and then painted the forward part of the hull. 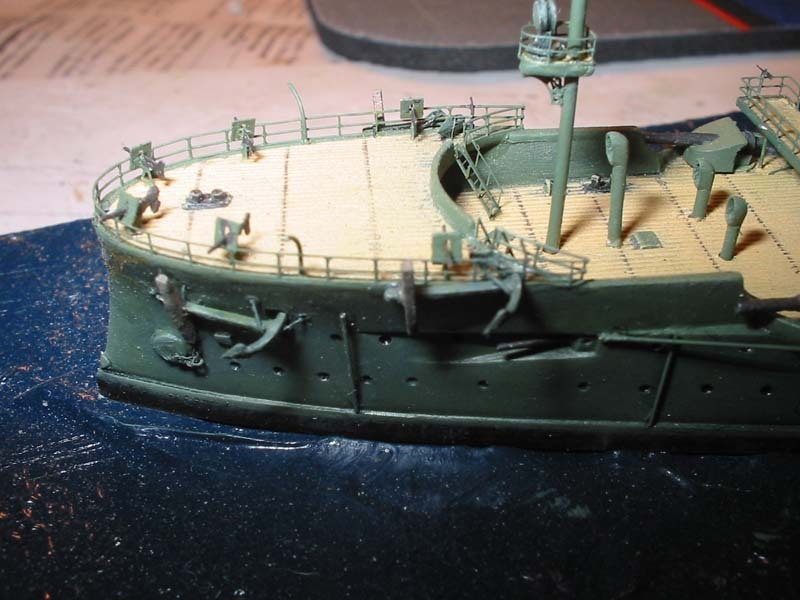 Once the hull was finished with painting I added the details to the hull. I've added the torpedo net booms, boat booms and various hatches along the sides of the hull. The funnel caps were also added at this time and flared in so that it is not visible that they came as separate pieces. I've also made the bow crest at this time. Rurik has a very large and well developed bow crest and to make it I've found the photo showing the bow from the sides, scanned it, and using Photoshop removed everything but the actual crest, which gave the half of the crest, which I then flipped and attached to the first part. Then I printed it in gold on a decal film using ALPS printer. 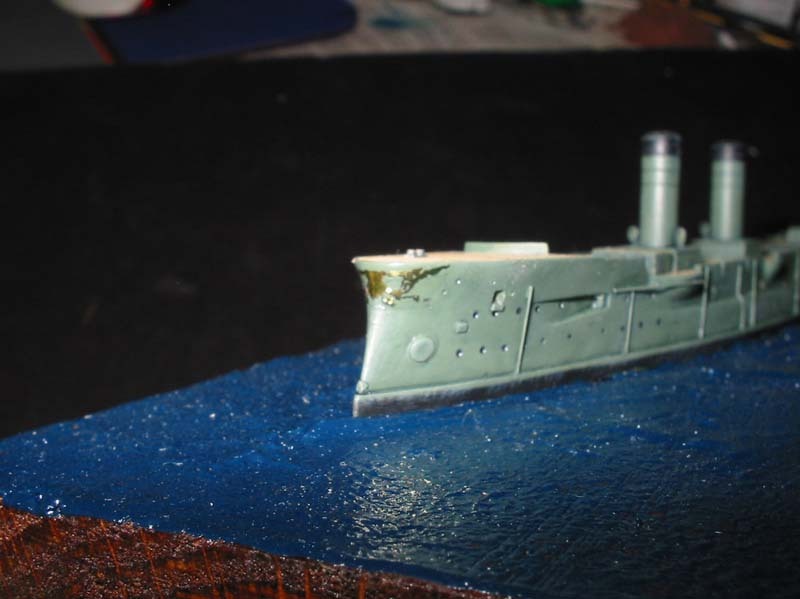 As a final part of the hull construction I've used my usual process of covering the hull with water soluble stuff that is called Black-It-Out to bring out the details on the hull. 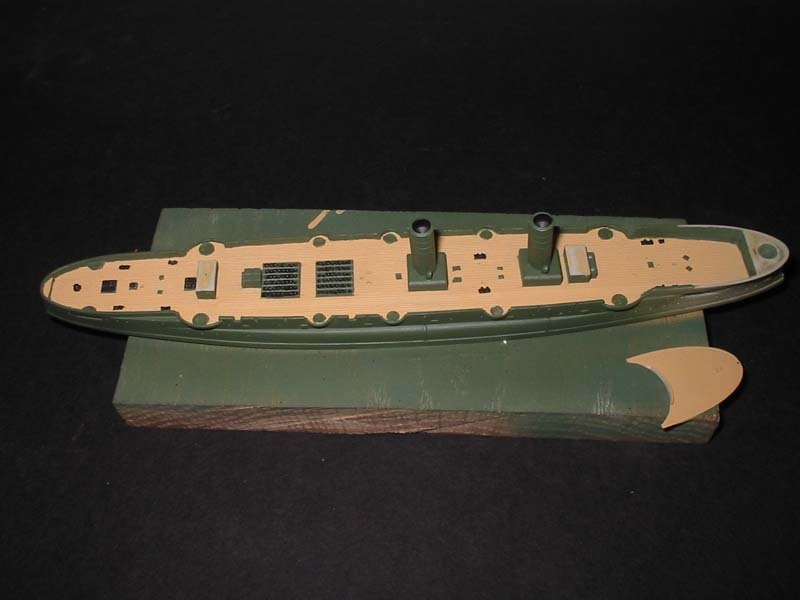 Once the stuff was dry, I've wiped off the excess using a Q-tip and then dry-brushed the hull with a lighter green color and the deck with light tan color..
As I usually do on most of my builds, once the basic hull was finished, I started working on the bridges and superstructure. Because the ship was laid out almost as a sailing vessel, there was a minimum superstructure. It had a front bridge with a conning tower and an aft bridge. Since the kit parts had built in splinter shielding on the bridges and there was no planking on them, I decided to scratchbuild the bridges. I cutoff the conning tower from the forward bridge and junked the rest of the bridge. I made the bridge from a 0.010 plastic sheet using my references. I scored it to make it look like it was made from wooden planking and to make sure that the bridge wings were straight I glued a 0.010 brass rod to prevent the wings from bowing. After that was done I glued the conning tower and the ventilation tubes and glued the completed bridge to the superstructure. 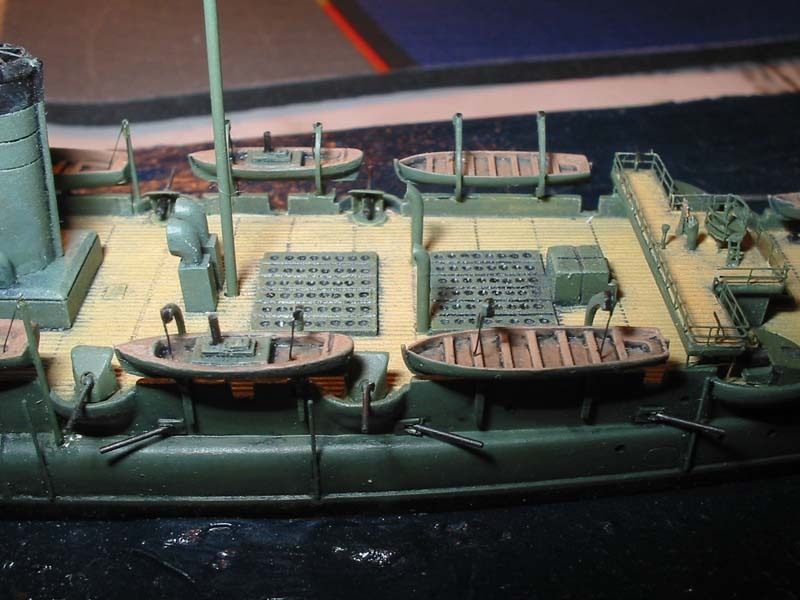 The same process was repeated for the aft bridge, where I scratchbuilt the compass platform using the pieces of WEM's Askold PE set. After both bridges were glued I added railings and ladders. Other details that were added were the anchors and the complex system that held them in place. The anchor chain was made from pieces of photo etch chain from Askold PE set. I cut apart the chain and using individual links I hooked them together to make it look like a real chain. I've also added railings and ladders to the foredeck and ventilators all over the ship. 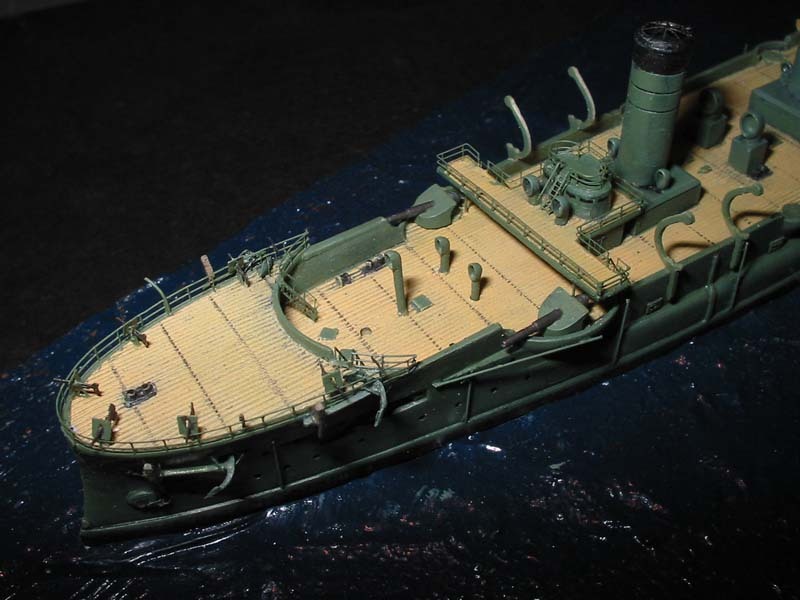 The ship was armed with four 8"/35 guns, sixteen 6"/45 and six 120mm/45 Canet guns, six 47mm and ten 37mm Hotchkiss anti-torpedo boat guns. I usually scratchbuild the guns that have an open gun shield, but because Kombrig's 8" guns are really well cast and because of their design which was almost half-turret like and the back of the shield is not easily visible, I decided to leave them as is. The only thing I did was drill out the gun barrels. 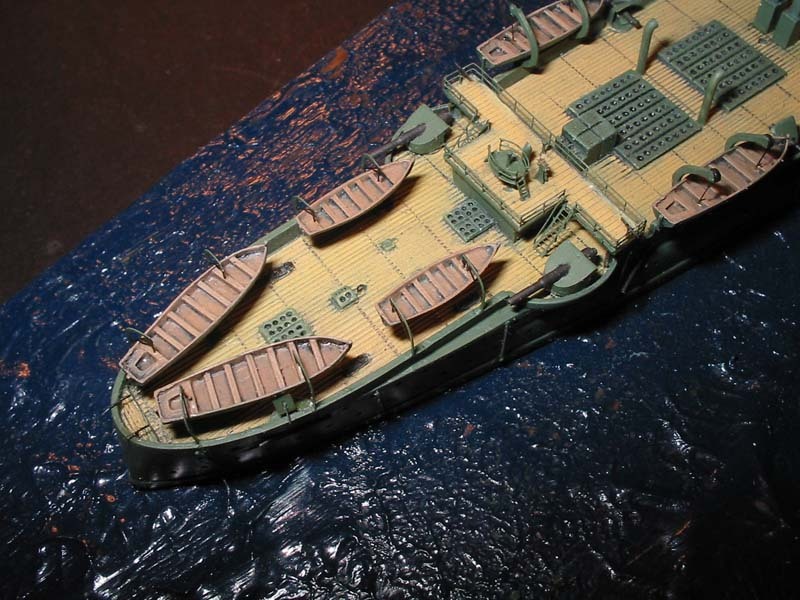 The 6" guns were all situated in the hull casemates so I used the appropriate tubing to create the barrels. 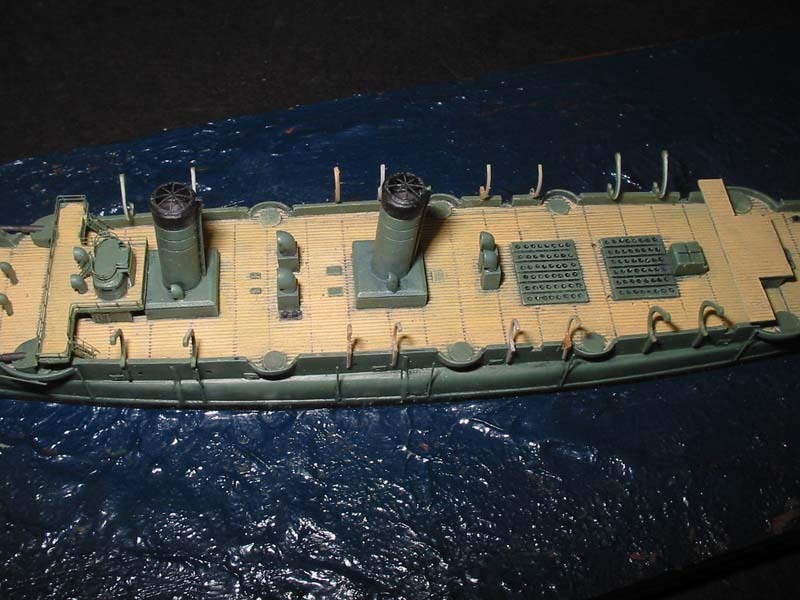 The most work in making the armament involved the 120mm guns. The kit had guns that looked nothing like the 120mm guns were supposed to look like, so I decided to scratchbuild them. I've made the barrels from hypodermic tubing and the mount from thin plastic. The gun shield was made by making a form and then heat-forming them. The final result has 6 parts and there were 6 guns, so it took a while to get them built. The Hotchkiss guns all came from the WEM's Askold PE set. The ship has 12 boats but the kit included only 8 boats, so I used two boats and two steam launches from WEM. The ship had eight boats on the complex davits amidships, but the kit provides enough davits for only four of them. To get the other four I went to my parts box and used the davits from an old Gromoboy's kit. The four boats on the stern were on the regular davits that I borrowed from the same Askold PE set that I got the rest of the details from. After the boats were installed the last thing to do was to make masts. 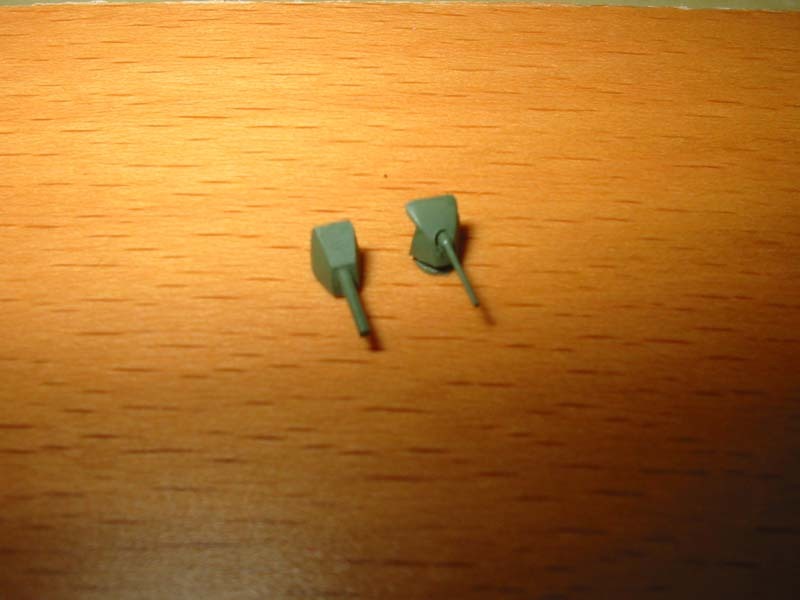 I scratchbuilt them using brass rod. Refer to the photos of the time period you are modeling for the exact location of the yardarms and platforms since the configuration changed many times. By the time RJW came around Rurik's bowsprit was removed, as was it's sailing rig, which made making the rigging and the masts much easier. 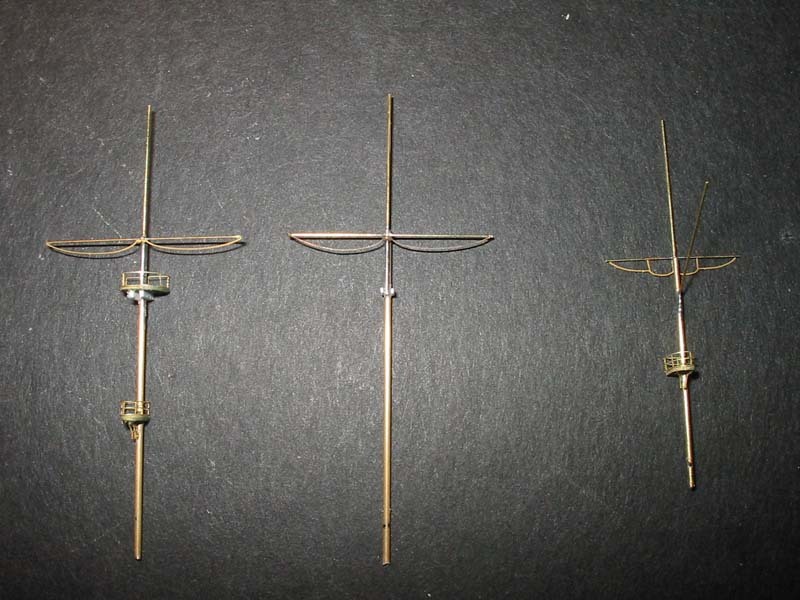 After soldering the masts, I've scratchbuilt all of the necessary platforms. The supports below the platforms came the Askold set - I took the perforated boat skids provided there and cut them in half and glued them upside down below the platforms. The ship was rigged using pantyhose. Flag came from a Russian decal set. Once everything was finished I weathered the ship with pastels and drybrushing. 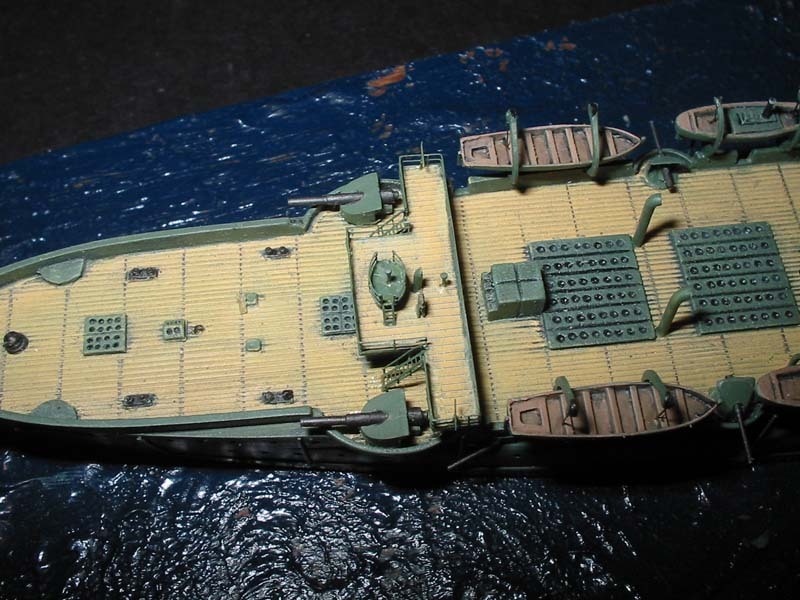 The ships of the Vladivostok cruiser squadron were very weathered, which can be seen in the photos of the ships, so I made white streaks of dry salt and rust stains on the hull sides. I dirtied the stacks and the masts with black pastels to simulate coal soot. After everything was finished I sprayed the whole model with Model Master Dullcote to cover all of the glue spots. This is a very good kit that build up into a beautiful model of an interesting ship. There are few very minor flaws that do not distract from the quality of the kit and are easily fixed. The kit was a pleasure to build. 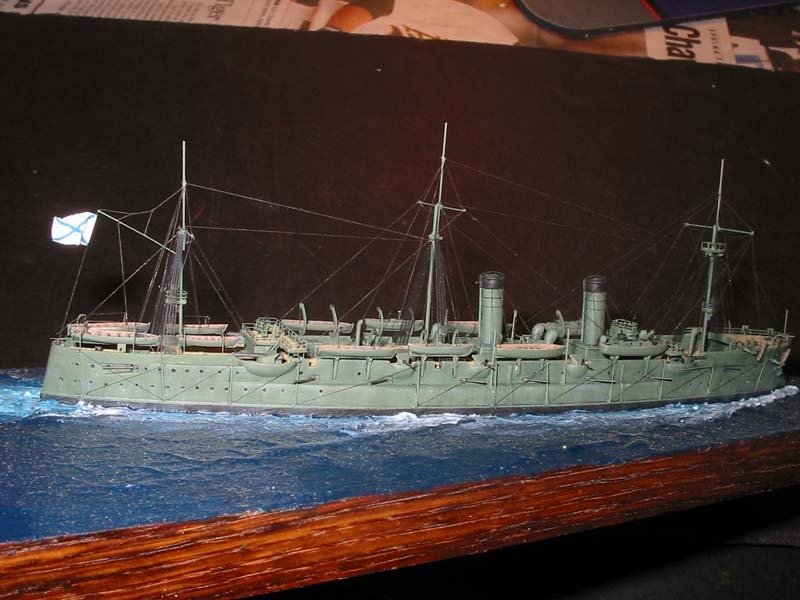 I would recommend this kit to anyone interested in the Russian ships or in the ships of the Russo-Japanese war.